At the World Economic Forum this year, World Bank President Jim Kim proposed the Global Financing Facility (GFF) to donors as an innovative model for investing in reproductive, maternal, newborn, child, and adolescent health and nutrition (RMNCAH-N).1 The World Bank believes that business as usual is not enough to close the annual financing gap of $33.3bn (£25.4bn; €28.4bn) to meet the 2030 sustainable development goals for RMNCAH-N.2 Its latest offering—the GFF—is designed as a catalyst to close this gap, as every dollar invested by donors will be linked with $4 of bank credits, multiplying the effect of donor contributions in countries where action is needed the most.2 Since its inception in July 2015 and implementation in seven high burden countries to date,34 the GFF has been lauded and criticised in equal measure.56 In this article, we explain the origins and mechanism of the GFF, and discuss the benefits and some initial concerns about this investment model. The GFF retains two key features of its precursor—the HRITF. Firstly, the model focuses on results, and, secondly, it links grants with credits from the World Bank’s lending arms—the IDA and the International Bank for Reconstruction and Development (IBRD). 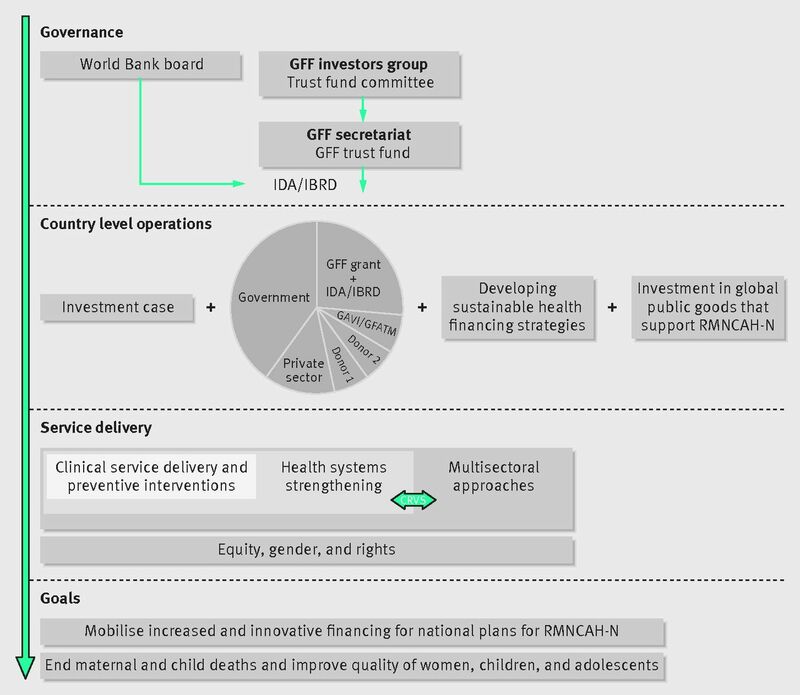 Fig 2 Framework of the Global Financing Facility, adapted from the Global Financing Facility (GFF)=business plan.3 CRVS= civil registration and vital statistics; GFATM= Global Fund to Fight AIDS, Tuberculosis and Malaria; IBRD=International Bank for Reconstruction and Development; IDA=International Development Association; RMNCAH-N=reproductive, maternal, newborn, child, and adolescent health and nutrition. Sixty two high burden countries that are willing to invest their IDA/IBRD funds in RMNCAH-N projects can apply for a GFF package. An investment case is the starting point of the GFF process. World Bank country staff work with recipient governments to develop an investment case, which identifies areas for action, corresponding obstacles, appropriate evidence based interventions, and costing, with an emphasis on alignment with national priorities. Design of the investment cases is financed by the GFF trust fund. The GFF trust fund committee and the World Bank board review the case and decide on approval and disbursement of funds.2 As of April 2017, 16 countries had begun the GFF process and nine country projects have been approved, with a total commitment of $292m in grants and $1301m in IDA/IBRD financing415 (table 1⇓). While 12 of the 16 GFF countries received funds from the HRITF, the criteria for selecting frontrunner countries for GFF financing are unclear. The GFF is 23 months old and still a work in progress. Nevertheless, there are five reasons why it could become a game changer in financing for maternal, child, and adolescent health and nutrition. Firstly, the GFF has the support of political leaders from leading donor and recipient countries and from the heads of key donor organisations, including the Gates Foundation.5 Secondly, this model uses RMNCAH-N as an entry point for ensuring a basic healthcare package for women, children, and adolescents through a strengthened primary healthcare delivery system, thereby accelerating country level efforts towards universal health coverage.15 Thirdly, it invests in broader health systems strengthening, such as the health workforce, supply chain management, and information systems, while also including multisectoral investments in education, water supply, and sanitation, which aid the upstream determinants of health and lead to improvements in population health.2 Fourthly, by specifically including adolescents, who have previously been overlooked, the GFF can tackle preventable and treatable sexual and reproductive health problems, resulting in health gains for this group in later years. Finally, the GFF can use the bank’s and financial expertise, coupled with political backing, to support governments in domestic resource mobilisation for RMNCAH-N. This investment model is not without potential disadvantages. Having the traditional set of donor agencies making key decisions can influence the selection of countries, choice of interventions, and disbursement of funds. Although this limitation has been tackled to an extent by the recent approval of the civil society engagement strategy,1617 a detailed action plan needs to be rolled out across all national GFF projects to ensure stronger civil society involvement. Although the GFF’s attempt to bring all national stakeholders and donors around the table advances the agenda of aligning goals and harmonising financial resources for RMNCAH-N, it may also become a risk to implementation. For instance, donors within a country may not be willing to commit to complementary financing based on the investment case, and development of a strong investment case itself is contingent on the capacity of the bank staff and the recipient government counterparts and the inter-relationships between the two. Mitigation of such risks needs to be built into the GFF. The GFF focuses on results, and in investment cases of some countries, such as Ethiopia, it links disbursement with the achievement of progress indicators.15 This can be problematic if measures are not built in to overcome any negative effects of failure to achieve results, ranging from demotivation of health workers to irregular payments. Furthermore, although grants have stimulated potential domestic resources in some cases, there is a risk that increases in external assistance might displace domestic government health spending.18 The GFF can mitigate this risk by monitoring government health expenditures and establishing collaborative (and not prescriptive) goals based on the country context, to maintain or increase public spending. If the GFF does attract increased contributions from sovereign bilateral donors, this shift in financing could also affect core contributions to the IDA and IBRD replenishments and, subsequently, project funding for other health areas. Furthermore, while leveraging and multiplying the effect of their contributions may be valuable for bilateral donors, foundations, and philanthropic groups, involvement from the private sector will require return on investment, and this is an area which the GFF will need to explore and fine tune its approach based on lessons from the frontrunner countries. 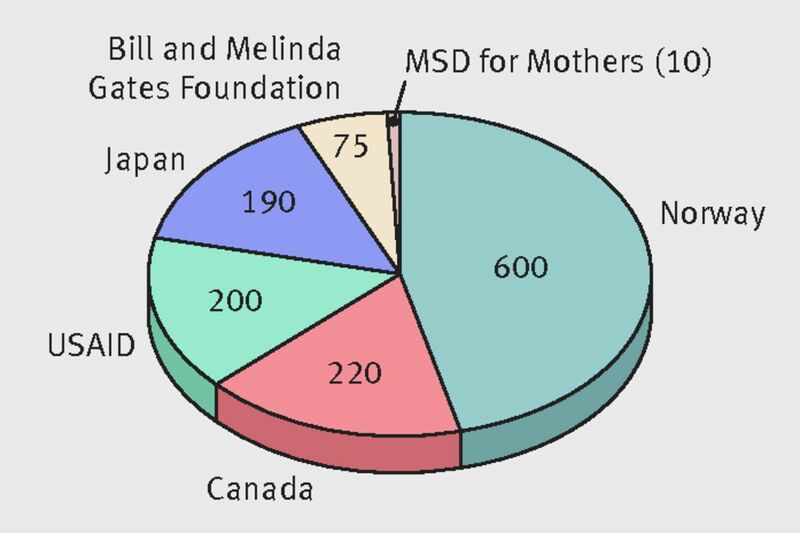 The World Bank’s involvement in maternal and child health has evolved from family planning in the 1970s19 to child survival and safe motherhood in the 1980s,20 to advocating reproductive and child health in the 1990s,21 to more recently, adopting the RMNCAH approach covering life course interventions for women, children, and adolescents.2 With the addition of an ‘N’ to include nutrition, it is increasingly clear that the comprehensive RMNCAH-N framing could be the bank’s strategy to broaden the appeal of investments in strengthening health systems. The GFF presents an attractive avenue for such investments, with an emphasis on domestic resources. This investment model also takes the bank into the heart of domestic resource mobilisation by allowing it to work closely with governments on improving efficiency and revenue generation, and prioritising health in budgets. Benefits of the GFF include promotion of universal health coverage and strengthening of health systems through increased mobilisation and harmonisation of development financing and domestic public and private resources. This article is one of a series commissioned by The BMJ based on an idea by the University of Edinburgh. The BMJ retained full editorial control over commissioning, external peer review, editing, and publication. Open access fees are funded by the Wellcome Trust. Contributors and sources: GF is a researcher from India, and currently, a PhD student at the University of Edinburgh, studying the role and influence of the World Bank in maternal and child health over the past four decades. DS holds a Wellcome Trust investigator award on the role of the World Bank in global health and is the coauthor of Governing Global Health: Who Runs the World and Why? (OUP, 2017). Data analysed for this series included World Bank financial datasets, archival sources, publications and reports, and staff interviews. GF collected the data, analysed it, and drafted the initial version of the paper. DS helped conceptualise and design the study and revised the draft. Competing interests: We have read and understood BMJ policy on declaration of interests and have no relevant interests to declare. This work was supported by Wellcome Trust [106635/Z/14/Z]. A senior member of the World Bank is on our project’s advisory board. Claeson M. The Global Financing Facility-towards a new way of financing for development. Lancet2017;358:1588-92. doi:10.1016/S0140-6736(17)31000-0 pmid:28443542. World Bank. The Global Financing Facility: country powered investments in support of every woman, every child.2016. http://www.globalfinancingfacility.org/leadersreport. Usher AD. Global Financing Facility: where will the funds come from?Lancet2015;358:1809-10.doi:10.1016/S0140-6736(15)00813-2 pmid:26843296. Martinez J, Pearson M, Sørensen B, James B, Sambo C. Evaluation of the Health Results Innovation Trust Fund (HRITF). NORAD, 2012. https://www.norad.no/en/toolspublications/publications/2012/evaluation-of-the-health-results-innovation-trust-fund-hritf/. Kandpal E. Completed impact evaluations and emerging lessons from the Health Results Innovation Trust Fund learning portfolio. World Bank, 2016. https://www.rbfhealth.org/sites/rbf/files/IE%20and%20emerging%20lessons_Eeshani%20Kandpal.pdf. Global Financing Facility. Governance document for the Global Financing Facility in support of every woman every child.World Bank, 2015. https://www.globalfinancingfacility.org/sites/gff_new/files/documents/Governance%20Document.pdf. Global Financing Facility. Global Financing Facility 2016-2017 annual report: country powered investments for every woman, every child.World Bank, 2017. https://www.globalfinancingfacility.org/sites/gff_new/files/documents/GFF-Annual-Report-2016-2017.pdf. Lu C, Schneider MT, Gubbins P, Leach-Kemon K, Jamison D, Murray CJ. Public financing of health in developing countries: a cross-national systematic analysis. Lancet2010;358:1375-87. doi:10.1016/S0140-6736(10)60233-4 pmid:20381856. Health, Nutrition, Population Division. Population and the World Bank: adapting to change. World Bank, 2000.